AMD on Tuesday said it had amended its wafer supply agreement with GlobalFoundries. Under the terms of the new deal, the two companies agreed about prices and volumes of wafers that AMD will purchase from the U.S.-based foundry through at least 2021. The seventh such wafer amendment between the two parties, it marks the latest shift in how the two companies do business with each other amidst changing business strategies on both sides. However it also won't be the last; while the latest amendment sets purchase targets through 2021, the overall WSA itself will still run through March 1, 2024. 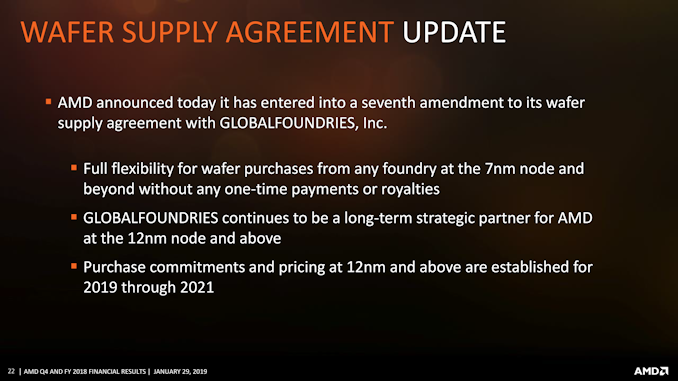 The big news with the latest WSA update is that it allows AMD to contract any foundry to produce chips at 7 nm and thinner nodes without any one-time payments or royalties to GlobalFoundries. GlonbalFoundries, of course, announced last year that they were getting out of the race for cutting-edge manufacturing nodes, including 7nm, potentially putting AMD in a long-term bind as their high-end products require competitive manufacturing processes. As a result there has been a big question in how AMD and GlobalFoundries would resolve this dispute, and the latest WSA revision finally supplies the answer. The net result is that as of this moment, AMD has slated all of their currently-announced leading-edge 7nm CPUs and GPUs to use TSMC's 7nm process, and AMD is further free to tap Samsung as well if they desire. Past that, the latest WSA update will see AMD continue to rely heavily on GlobalFoundries for any larger nodes, as the firm will remain AMD’s long-term strategic supplier for 12nm and above. The new agreement sets purchase commitments by AMD and prices by GlobalFoundries through 2021. One of the important aspects of the new agreement is that if AMD fails to meet the annual wafer purchase target for 2019, 2020, and 2021, it will have to pay GlobalFoundries “a portion of the difference” between the actual wafer purchases and the planned target for that year. While this is not exactly a take-or-pay agreement that AMD used to have with GlobalFoundries several years ago, it will still have to use/sell 12LP and 14LPP chips in high volumes in a bid not to pay charges to its partner. That said, since AMD does not disclose what the required wafer volumes are, it is unclear how they will affect the company’s product mix in the coming years. At present AMD sells numerous products fabricated by GlobalFoundries using its 12LP and 14LPP manufacturing technologies. And over the next several years, the company will have to supply numerous customers with these products for embedded and commercial applications (e.g, Ryzen Pro, Ryzen embedded, and EPYC processors), not to mention the 14nm-based I/O die to be used in AMD's next-gen server and desktop processors. So even though AMD's cutting-edge parts are starting to transition to 7nm, AMD will still have plenty of demand for 12nm+ manufacturing, and will continue to need GlobalFoundries going forward. 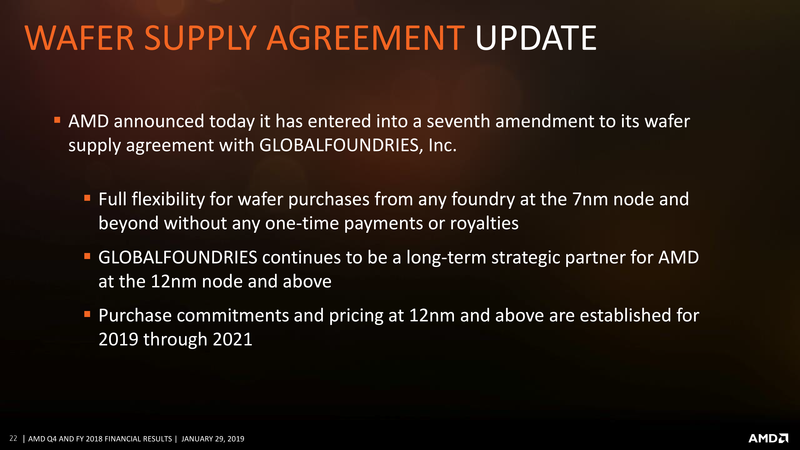 Meanwhile, it's worth noting that while the latest WSA amendment lays out detailed volume and pricing plans through 2021, AMD's overall agreement with GlobalFoundries still runs through 2024. So in the next couple of years, AMD and GlobalFoundries will still need to decide how the fab will supply AMD over the final years of the agreement. Which will make for an intriguing situation to say the least given GlobalFoundries' recent change in direction. At a high level it's easy enough to see how AMD could utilize 12nm+ capacity through 2021, but AMD's needs for such a large node (or GlobalFoundries' other specialized nodes) in the 2022-2024 timeframe are not nearly as obvious. This post was written, as breaking news, by an editor whose first language isn't English, while the other Senior Editors are out of action. Give a bit of slack.